Last month a group of Juicers attended a lecture at Georgia Tech entitled “More Than Insights: Beyond Exploratory Data Visualization” given by Hanspeter Pfister, Professor of Computer Science and Director of the Institute for Applied Computational Science at Harvard University. Pfister cited the rise of the infographic, as well as an increased general interest in subjects like data storytelling and data journalism as evidence that more and more people are becoming interested in using visualization to communicate and explore information. But what comes after information is shared? Being able to address the “so what” brings a whole new set of challenges to data communication, Pfister told the audience. He explained that we’ve only just begun to scratch the surface of what is possible, that we actually don’t know as much as we think we do about these subjects, and that much more research is needed to even begin to understand these intricacies. To illustrate his point, he used examples from three different subject areas: data visualization, data storytelling, and data tools. Pfister cited a study that he had participated in along with Michelle Borkin on what makes a visualization memorable. In the study, participants were shown a string of various visualizations and told to respond if they remembered having seen it previously. So what did the researchers find made a visualization memorable? The charts were found to be more memorable if they contained human recognizable objects (such as dinosaurs or faces), if it was colorful, visually dense, or had a title, labels, and/or paragraphs. Pfister then brought up the ultra-new method of using comics to communicate data. Ultra-new because, as Pfister pointed out, there are few actually using comics to communicate data, there is no real definition of what a data comic actually is, and there are no real tools to create data comics. A data comic, he explained, is communicating data in a way that comic books typically communicate stories. He explained that the four essentials for data comics were visualization flow, narration, words, and pictures, and demonstrated how all of these work together by displaying a data comic that showed the various power struggles that contributed to World War I. Viewing the information in the form of a data comic was a faster and clearer way to communicate the information than any textbook could have done. It was evident from this example that data comics are more likely to play a larger role in the future, but, Pfister questioned, how will it fit into data storytelling overall? The last subject Pfister hit on was data tools. He explained how the majority of popular data tools are relatively easy to use, but lack ability to customize visualizations easily. On the other side of the spectrum, however, are tools that are more expressive but lack ability to add insight. He argued that data scientists not only want but deserve better tools, and because of this there should be a product that falls somewhere in between Excel and InDesign. The answer that Pfister and a team of individuals, in collaboration with Adobe, came up with was a program in which the user puts data into a spreadsheet, then uses guides that constrain the data to create a visualization. It was an interesting way of displaying data, but will it satisfy data scientists’ quest for the perfect tool? Only time will tell. It was clear from Pfister’s lecture that more research needs to be done in all of these areas before we can truly say for sure what the best methods of communicating data are. It’s an exciting time to be in visualization, and we’re excited to see what the future brings. In the meantime though, check out our design principles for what we’ve found to be some pretty effective strategies for communicating data. You’ve connected your data highways, built the bridges, and now it’s time to take a ride. Do you have the right vehicle? Do you even have a vehicle? Hopefully you’ve put some plan in place to extract value out of your information highway. If not, may God have mercy on your soul and the executive who decided to fund your bridge to nowhere. Most likely you know what it is you hope to get out of your “Big Data” investment, but there are a lot of unanswered questions. It’s no surprise why it’s so tempting to try to whittle the selection down to one vendor that does it all. You’ve convinced yourself that if you select one vendor, this decision will save money and eliminate the potential indigestion of integrating with multiple vendors from the Big Data buffet. The El Camino was the ultimate utility play for people who wanted something that could haul like a truck yet still ride like a sedan. It was a one-size-fits-all solution for motorists, but unfortunately it was neither a great sedan nor a good truck. Let’s imagine for a minute that you’re in the construction industry and competing for a bid to deliver construction materials. The job is 1 mile off-road in the mountains and the prospective client asks what kind of vehicle you’ll be using to deliver the materials. You tell the client “I’ve got an El Camino, it’s a car with a truck bed!” Your competitor submits a bid and tells the client they’ll be using a F350 Super Duty V8 4x4. Who do you think wins that bid? How does this relate to your problem? Let’s imagine now that you’re building a data product. Many vendors in the data analytics space bill their products as a one size fits all solution, like the El Camino. Picking one vendor to do everything can leave you with an undersized and underperforming platform. The vendor you selected gave you a great ad-hoc tool, but their data presentation/communication platform is seriously lacking. Your potential client takes one look at your platform and decides they only want to pay for access to your data at a fraction of what you hoped to charge for your product. You’re stuck in the mud with an El Camino full of data bricks. It’s worth noting that the executive dashboard is for executives and the ad-hoc tool is for analysts. Last time I checked, executives were the ones who were responsible for cutting checks. It’s always important to pick the right vendors for any job. Don’t expect to find a one-size-fits-all tool in the Big Data space. When building a data product, remember that the presentation of the meaning, flow, and story of your data is more important than any ad-hoc capabilities. If you fall short on effectively communicating the value of your solution, you may soon find yourself standing alone on that bridge to nowhere. Need help finding the solution that best solves your data problems? Check out Juice's new tool, the Buyer's Guide to Analytics Solutions. "Actionable data." It is a phrase well on its way to becoming a cliché. But clichés are often founded in truth, and it's true that the essential quest in analytics is finding data that will guide people to useful actions. Apple’s battery meter offers a lesson in the challenges in delivering such actionable data. It's an issue of excess precision. Users want to know a precise time-remaining answer, but the fundamental nature of the machine results in a great deal of variance. I first heard about this problem from the excellent Accidental Tech Podcast. During the discussion, John Siracusa suggests an alternative to the problem: a burn-down chart like the kind used in agile software development. Android phones offer something that looks a lot like what he describes. Siracusa admits that a more detailed visualization of this nature probably isn’t for everyone. It may work for him (and I like it a lot), but not everyone spends their days visualizing data. It's a classic Goldilocks problem. Too little detail (and too much precision) can be deceptive and difficult for users to understand when the number jumps around. The lonely key metric without context can be inscrutable. Too much detail, such as in the form of a full-fledged chart, may be more information than the average user wants to know. The predominant feature of the chart, the slope of the trend, isn’t fundamentally what the casual user cares about. They want to know if the battery is going to still have life when they are getting to the exciting final scene in their movie. 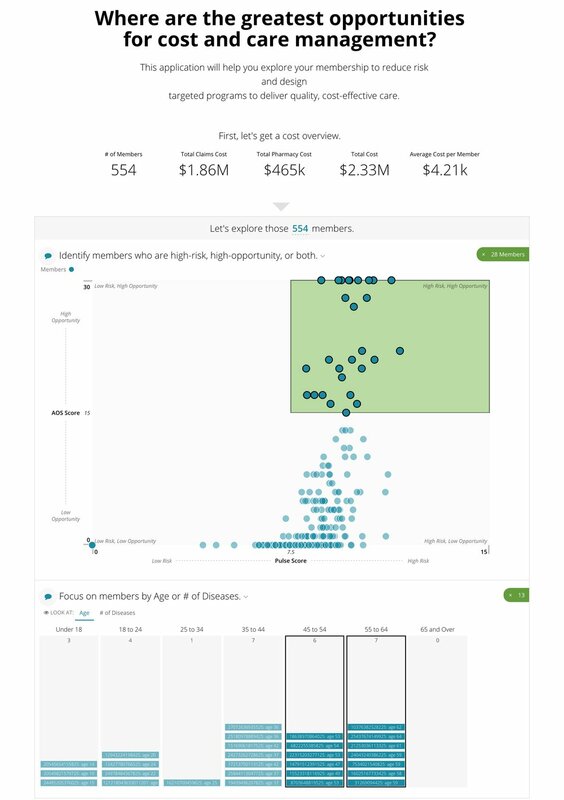 Data visualizations should not be engineers serving engineers (as I noted when Logi Analytics asked that Fitbit embed a self-service business intelligence dashboard in their apps). When it comes down to it, the problems Apple faces with its battery life estimates aren't so different from the problems we all face in delivering actionable data. The solution can be boiled down to a simple formula: Use the data to solve the problem. Keep the user informed. Give them a smart choice. And always have your charger handy, just in case. Book Review: "Bringing Numbers to Life"
"The effort was none other than to do the hard work of bridging numbers and people, and building that work into products that entice, even seduce, skeptical users to invest in an unfamiliar activity." In his new book "Bringing Numbers to Life", John Armitage sets out to create a design framework for analytical apps. It is a worthy subject and one that is close to home for our Juice team. Mr. Armitage’s book has been published online and free-of-charge by the Interaction Design Foundation. The Foundation’s founder, Mads Soegaard, shared their vision: "We offer complete, unrestricted and free access to our chapters/books/textbooks in online versions. Everything we do is a labour of love and not a business model. We walk the talk of altruism.” The IDF hosts a wealth of free materials and textbooks, with contributions from top academics and professionals. The book is a worthy subject delivered by a worthy organization. I was happy to share my thoughts. “The result of this effort was a number of prototype projects that led to LAVA, a design language for visual analytic environments intended for broad application across the SAP product suite. The key driver behind LAVA was simplicity and low cost, which translated into some fundamental innovations that, with the backing of a large company like SAP, stand to improve the clarity and reach of visual analytic consumption in the workplace and beyond." The analyst’s office is filled with books by Edward Tufte, Stephen Few, and Alberto Cairo providing guidance on how to visualize data. But what about the designer or developer of analytical solutions? Their challenge is in many ways more complex. Armitage makes an important distinction between “Artisanal" and “Production" solutions. It is one thing to craft a one-off visualization solution for a specific purpose. In these cases, the author knows the data, the audience, and the specific message they want to convey. His challenge is to develop a system that can repeatedly deliver high quality data visualization and analytical tools. It is the difference between the carpenter who can craft a single table and the engineer who can create a factory that delivers a thousand tables. The requirements, skills, and frameworks are very different. Charts can exist at different levels of detail and fidelity. When we want to represent a concept, it may appear as a single number or sparkling (“micro chart”) or a fully-labeled trend chart (“chart”) or as part of a multi-component, interactive visualization (“meta chart”). Analytical tools need a hierarchy of components that allow a user to consider a broad concept, drill into more detailed topics, and explore specific data. Modern analytical applications need to offer much more than the visualization of data. Features for sharing, collecting insights, and personalization are necessary to deliver a complete analytical tool. The traditional single-page dashboard design is antiquated. "Scrolling effectively increases the virtual size of your display outside the borders of your window or device, and is a basic convention for digital content consumption that has been ignored in traditional dashboard design." Armitage is also a critic of the increasingly complex and bloated analytical solutions — something I hear more and more from companies frustrated with visual analytics tools like Tableau. "Currently, however, most visual analytic solutions reflect previous efforts to serve large high-paying enterprise customers, and are thus bloated with features designed for highly trained – and high-paying – specialists. As Clayton Christenson’s principle, and associated book titled The Innovator’s Dilemma tells us, companies in such high-margin businesses are beholden to serving their large customers, and thus leave the low-end of the business exposed to inroads by newcomers to the market. Visual analytic market leaders are facing such a dilemma today." Despite my fondness for the topic and appreciation of Armitage’s evident research, the book has issues that I found hard to overlook. “I even produced a farcical off-site video on the theme of multinational collaboration, and a comedy routine – based on the famous “Who’s on First?” from Abbot and Costello – to poke fun at working in multinational teams. I performed the latter live with Jay Xiong at our 2012 office holiday party in Shanghai." "Although LAVA, in particular the Lattice, pointed to similar effects for quantitative data, it was difficult for some people who were particularly close to BI to acknowledge its potential. The definitive objection from this faction was that LAVA “does not match Our metaphor”, which was of course precisely the point. LAVA is a new metaphor, and one that’s necessary for achieving SAP’s product aspirations." I have a deeper concern with some of the recommendations for visual solutions. One of the features concepts is a "Lattice chart”. I found the example provided to be confusing and complex. Designing visualizations is an exercise in finding simplicity and accessibility for your audience. The image below is crammed full of information, but lacks the legend or space for a typical user to know what it all means. Perhaps my biggest concern is with Armitage’s long-term vision. He expresses a desire to create an analytics world where human intervention isn’t necessary to communicate data effectively. With this scalable framework in place, we can start to dream of efficiencies on a large scale, with entire Board Sets generated automatically from adequately-provisioned data warehouses. Filters, Panels, and Lattices can be determined with a rules engine automatically from combinations of Measures and Dimensions. Galleries can be populated by algorithm-generated charts derived from the most relevant Lattice Layers. Points can be created from data set indexing and data mining, and populated with major category representations and outliers. Multiple data sets can be organized into groups and presented as Board Sets, or one giant data set can be subdivided into Boards according to individual or sets of Measures or Dimensions, with these Boards further subdivided into Categories and Lattice stacks according to the depth and complexity of the data. These efficiencies will allow more people to use data to make decisions, and require fewer people to support them. In my experience, data communication needs to start with an intimate knowledge of the business context, an appreciation for your audience, and an understanding of what it takes to make them more effective in their jobs. These aren’t things that can be scraped from a database. Philosophical issues aside, this is a book about Armitage’s journey in trying to change how an organization delivers analytics, his process and research, and the quite-useful framework that came from his journey. As someone who has tackled the same design challenges in creating a new kind of tool for visualizing data, I appreciated being able to get an up-close view of how another professional wrestled with common challenges. In describing his conclusions, John Armitage notes, "During LAVA’s development, I found myself surprised that nobody had before arrived at our fairly simple and basic conclusions." Don’t worry, John, you’re not alone. DJ Patil (U.S. Chief Data Scientist) defines data products as "a product that facilitates an end goal through the use of data.” I’ve described data products as turning analytics inside-out to deliver value to your customers. But the question we most often get is: How are data products different from the customer reporting we already provide? 1. Instead of summarizing data, solve a problem. Most reporting simply regurgitates data in a semi-aggregated format. A data product starts with customer’s pain points and asks how data can bring insight and better decisions. 2. Instead of starting from the data, start from the customer. Report writers will often look at the data available to them and ask "How can we deliver all this information?" That’s what gets you to self-service analytics tools sitting on top of data. Not good. Data products need to start by asking how you can make your customers smarter and more effective in their job. 3. Instead of stopping at showing the data, guide users to specific actions. Customer reporting may be satisfied with making data accessible. Data products need to do more — they need to move people to take action. Start from the end point: what kinds of things do you want your users to do? How will you give them the right information? 4. Instead of focusing on metric values, deliver context for decisions. Key metrics are only as good as the context you put around them. Data products wrap context around metrics with goals, benchmarks, comparison, and trends. Then your users will know how they should react to the numbers they are seeing. 5. Instead of passive objectivity, bake-in best practices, predictive models, and/or recommendations. “Let the data speak for itself” — that’s like a chef saying: let the diners enjoy the raw ingredients. Bring your expertise to the data product. Your customer knows their pain — but you know the data and what can be done with it. 6. Instead of trying to show more data, reduced to only the data needed. 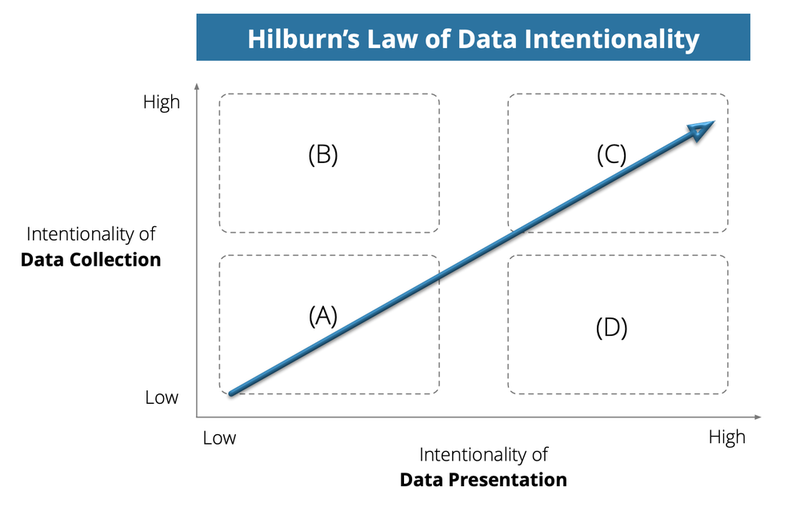 When it comes to presenting information, more data is seldom better. Customer reporting only expands — into dozens of dashboards or reports. Data products should strive for less. 7. Instead of putting the burden on users to figure it out, strive to reduce burden. Customer reporting tosses responsibility to the customer, effectively saying "you figure out what’s important to you.” Data products recognize that few people inherently enjoy messing with data; most people just want to be better at what they do. The data can facilitate that goal. 8. Instead of being designed for analysts, data products are designed for decision makers. Many customer reporting solutions assume the end-user wants to dig in and analyze the data. Data products are for a different audience: front-line decision-makers. These people are busy with their regular job and have little interest in learning something new. 9. Instead of “show me the data”, strive to make the data invisible. The best data products of the future will make the data invisible. Consider how Google Search tries to predict your need and point you to the best answer at the top of your search results. Google wants to hide the data (search results) and jump straight to the answer. 10. Instead of a cost-center for your business, become a profit center and differentiator. Customer reporting is considered a necessary evil for many companies. For example, we’ve had dozens of conversations with advertising agencies who feel compelled to provide reporting, but clearly don’t relish the task. In contrast, companies that view their customer data as an asset recognize that they can create new revenue streams. That’s where Juicebox comes in — it is the quickest, best path to turn your data into differentiated, revenue-generating data products.